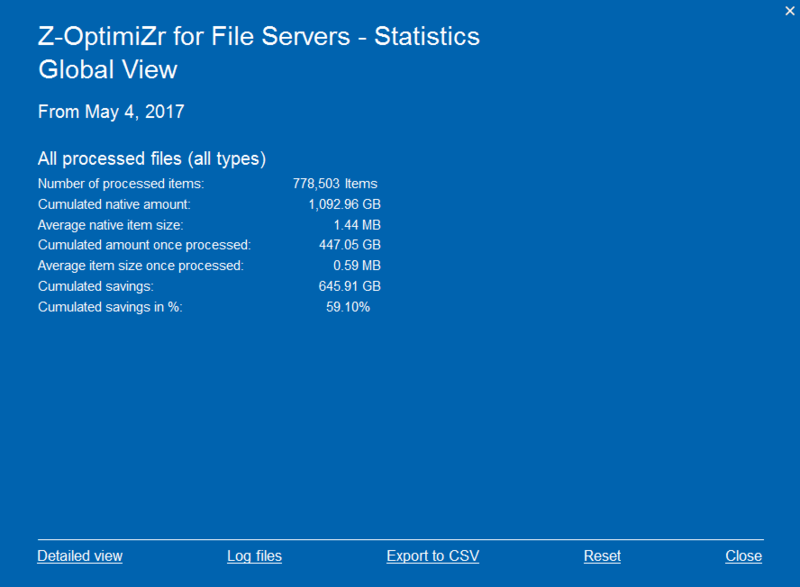 Z-OptimiZr for File Servers - Recover 50% of your file server disk space! Z-OptimiZr for File Servers is a software solution that reduces the size of the files stored on your file servers. 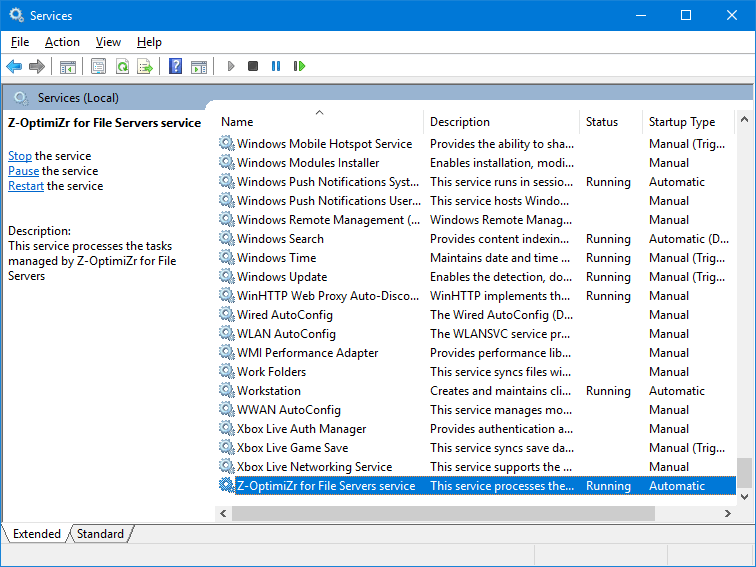 Z-OptimiZr for File Servers is based on a Windows service (the optimization engine) that is managed and scheduled by a Windows application made available from the Windows task bar system tray. This application enables to create, manage, schedule and monitor optimization tasks applying to given folders. Most of the issues (performance, maintenance, costs) related to your file servers are caused by data volumes exceeding the capacity of your file servers, and of their underlying network and storage infrastructures, to process them in an acceptable amount of time. Terabytes and terabytes of Word documents, PowerPoint presentations, Excel spreadsheets and other image and picture files stored on your file servers require enormous amount of network bandwidth and disk IOs to be served to your users. You regularly need to add storage space extensions to your file servers in order to handle the flow of new files continuously uploaded and downloaded by the users to and from your file servers. Files stored on file servers are frequently replicated to other clustered servers and/or backed-up. Thus for a each given file, the total amount of disk space that is really consumed is frequently 2 or 3 times (or even more) the volume of the file. Z-OptimiZr for File Servers can reduce the volume of these files (by 50% on average), automatically and transparently for your users. The optimized files remain in their native format. Optimized MS Office files remain MS Office files, Optimized JPG files remain JPG files. Users see no difference between the original files and he optimized files when opening them in their usual applications (MS Office, Image editor and viewers…). Got the principle? Now of course you are probably wondering about the implementation; By how much does Z-OptimiZr for File Servers reduce the size of the files? where can I find samples of files before and after optimization? Can the optimization job be scheduled? Which types of files can be optimized natively? What about files than cannot be optimized natively if any? How to evaluate the savings on a given server or on a set of folders? What is Z-OptimiZr for File Servers? Once Z-OptimiZr for File Servers is installed, this service is running and ready to schedule and process optimization tasks. There is no optimization task yet. You need to create them (see next). 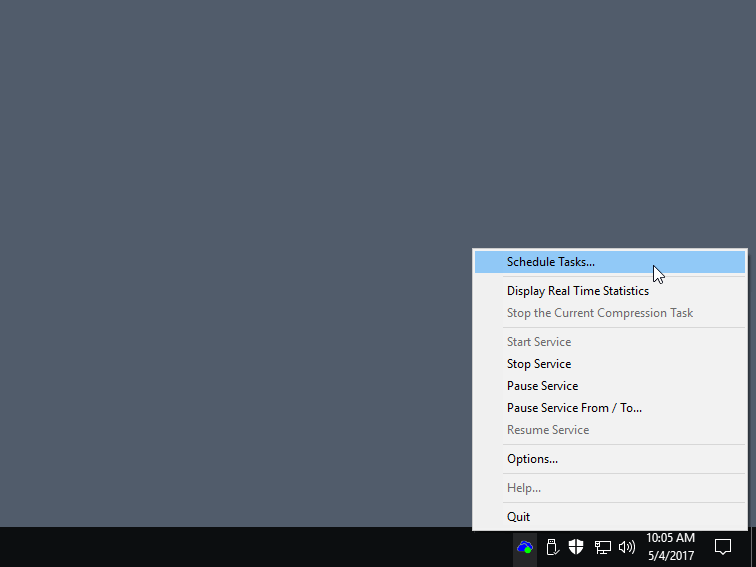 In the Windows System Tray area, click on the Z-OptimiZr for File Servers icon (the blue cloud with a green light) and select the Schedule Tasks... menu. Launched via the Z-OptimiZr for File Servers system tray utility Schedule Tasks... menu, the Manager enables you to create, manage, schedule and monitor optimization tasks applying to given folders. In the screenshot below, 3 tasks have been created and scheduled. As you can see these tasks have already been executed. 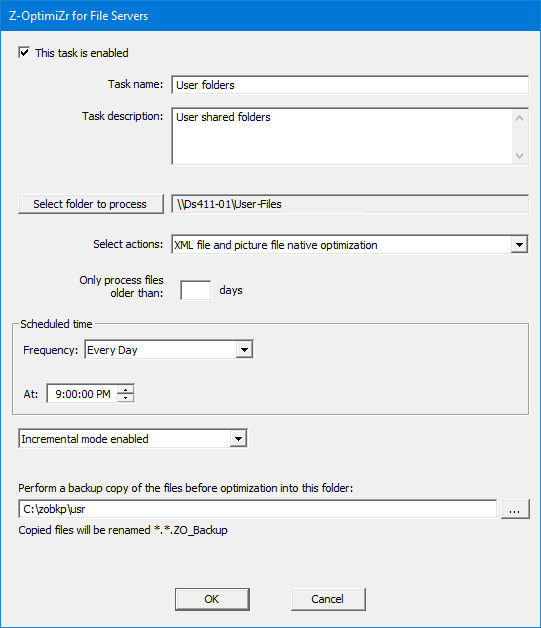 For each task, you can see the type of optimization actions, the folder to process, the task last run and last stop date-times, some numbers related to the task like the accumulated amount of recovered disk space as well as information related to the files processed by this task the last time it was executed. When a task is running, these numbers are refreshed in real time. This is an example of a task being created or edited from the the Z-OptimiZr Manager (displayed above). 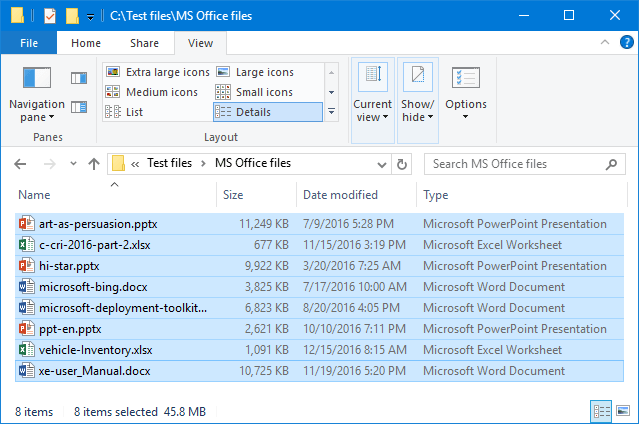 This tasks applies Native Optimization for MS Office files and picture files to the files located in the \\DS411-01\User-Files folder (and its sub-folders). Incremental mode is enabled; this means that this task remembers the files already processed during previous runs and promptly skips these files if any. Each files to process is backed-up to C:\zobkp\usr before to be optimized. This is another example of task being created or edited from the the Z-OptimiZr Manager. This tasks applies Native optimization of picture files + reduction to HD to the files located in the \\DS411-01\Image Lib 1920 x 1080 folder (and its sub-folders). The task is scheduled to execute each 2 hours. This is one of the numerous scheduling options available. Incremental mode is enabled; this task remembers the files already processed during previous runs and promptly skips these files if any. Accessible from the Z-OptimiZr for File Servers System Tray utility Display Real Time Statistics menu, the Statistics App displays the optimization results in terms of recovered disk space. This is the Global View. It is updated in real time when Z-OptimiZr is optimizing files. And this is the Detailed View displaying the amount of recovered disk space per file types. It is also updated in real time when Z-OptimiZr is optimizing files. You can also find additional information like the average size of the processed files before and after optimization or conversion. See below few Microsoft Office files before Z-OptimiZr for File Servers has optimized them (45.8 MB in total). These files (before and after optimization) are available for download here. You can so check that the quality of the files is fully preserved after optimization. The total size of the files is now 15.8 MB. It is interesting to see that Z-OptimiZr for File Server has preserved the last modification dates of the files. Thus the users can continue to sort their files by dates as they did before the optimization. See below few Picture files before Z-OptimiZr for File Servers has optimized them (53.7 MB in total). The total size of the files is now 19.5 MB. (*1) The volume reduction ratio delivered by Z-OptimiZr for File Servers varies with the content of the files. 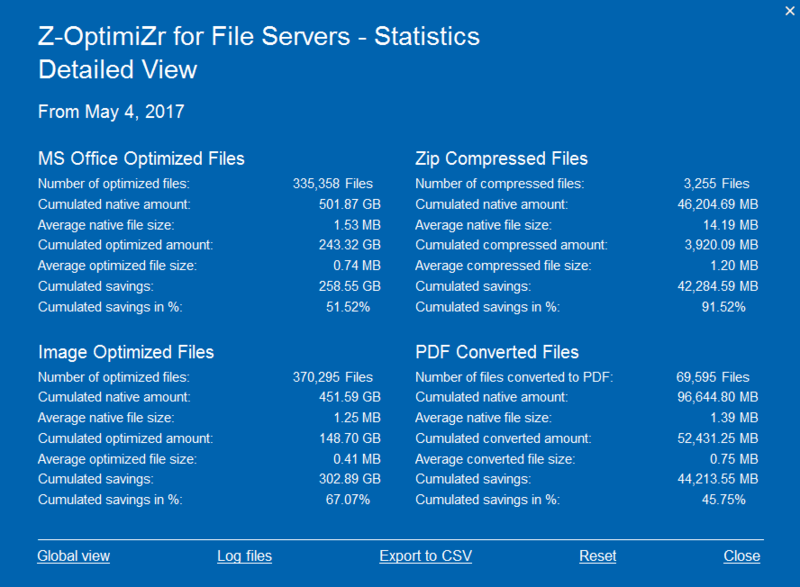 To know by how much Z-OptimiZr for File Servers is able to reduce the size of your own files, please download an evaluation version and test for yourself! 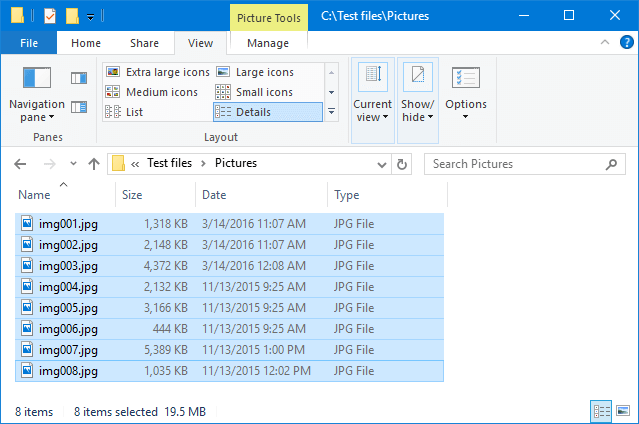 In the above test on picture files, the dimensions in pixels of the pictures have been fully preserved. 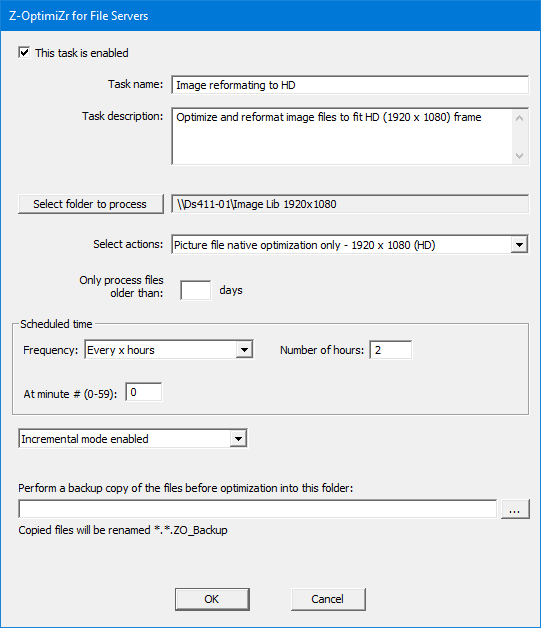 Additionally to picture optimization, Z-OptimiZr for File Servers tasks can also be configured to resize the pictures to a given size, for instance HD (1920 x 1080 pixels). If this Resize to HD setting had been applied to the above picture files, the amount of recovered disk space would have jumped from 63% to 95%. You can display and download the above picture files before optimization, after optimization, and after optimization + resizing to HD here.